Mission West Virginia was started in 1997 by then-Governor Cecil H. Underwood to promote cooperation and support for WV Communities. 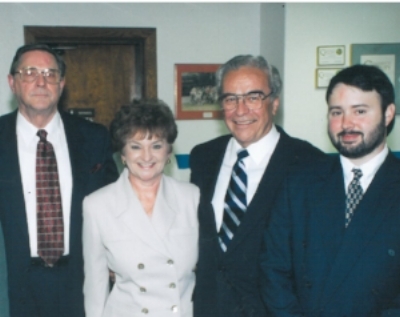 Pictured, from left, are the original executive director, Rev. F. Emerson Wood, his wife, B.J. Wood, Gov. Underwood and David Rogers. This page will contain the working documents of the organization for viewing by the organization's board members. The web address for this page is not published, meaining no one should be able to access it unless they know the exact address to put in their web browser. However, no identifying information or financial information beyond what is public information will be posted until a secured folder system can be put in place.